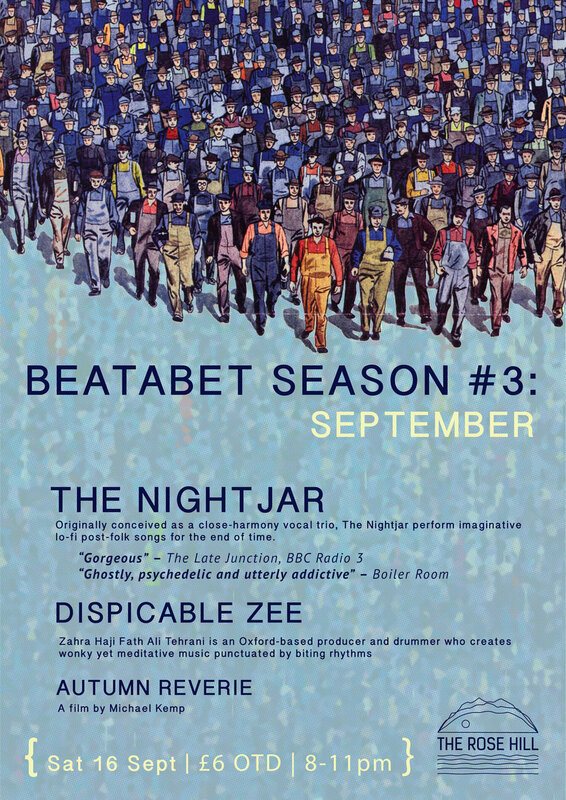 Beatabet -the collective and label that run and curate The Rose Hill are back with our new season of monthly events! We are really excited about both these acts. They are totally different to eachother but what they have in common is their exploratory bold approach to music. Despicable Zee aka Zahra Haji Fath Ali Tehrani is an Oxford-based producer and drummer who creates wonky yet meditative lo-fi tunes, punctuated by biting rhythms. Newly working with her own vocal and lyrical content, layering melancholy, lazy melodies to shape a vocal sound that sits somewhere between poetry and quiet rap. The songs are steeped in issues relating to identity, heritage, relationships and change - they sound like echoes of something, partially forgotten. Whilst being a one-woman project, she has worked with samples of her newborn, and lullabies from her Irish mother and her grandmother in Iran. Her second EP Wednesday’s Child attempts to reconcile different cultures, generations and memories that may be separated by thousands of miles, or thousands of years. In this she explores what motherhood means to her and tries to finds her own place in a lineage, where the past and the future intersect.